If you are a die-hard fan like me, you will probably think the link below is as hilarious as I do. However, it also has practical purposes because even though it’s told in a funny way the video effectively describes the previous six films in under three minutes! After watching the above video you now have a quick background of the past six films and are ready for the overview of the newest instalment. 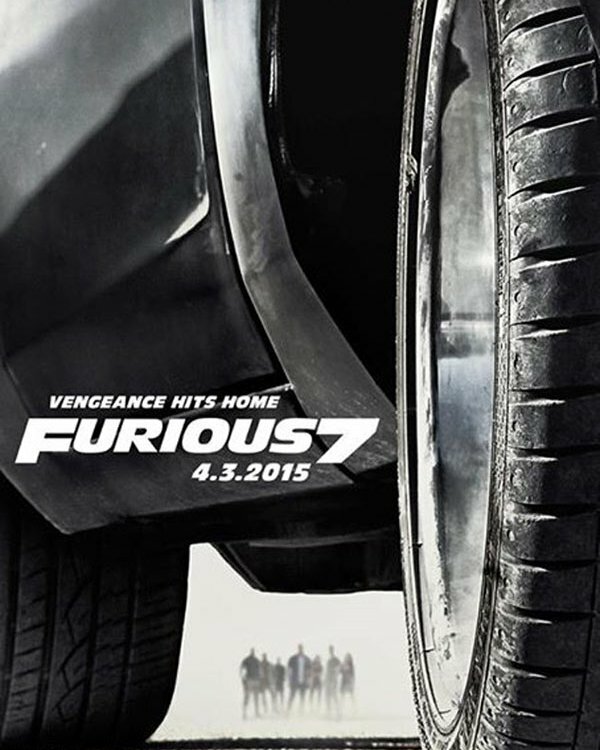 Furious 7 is an action film directed by James Wan and written by Chris Morgan, and is the seventh instalment of the Fast & Furious Franchise. 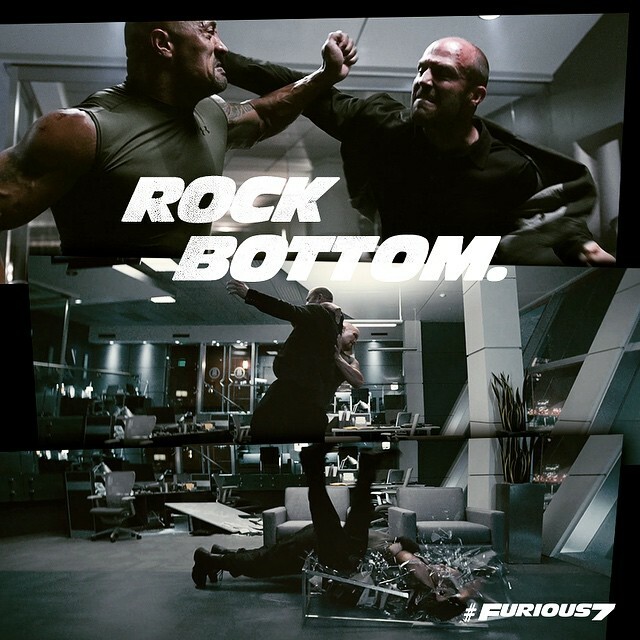 This film follows Dominic Toretto (Vin Diesel), Brian O’Conner (Paul Walker), and the rest of the gang as they take one last ride to defeat Deckard Shaw, played by the action film veteran Jason Statham. 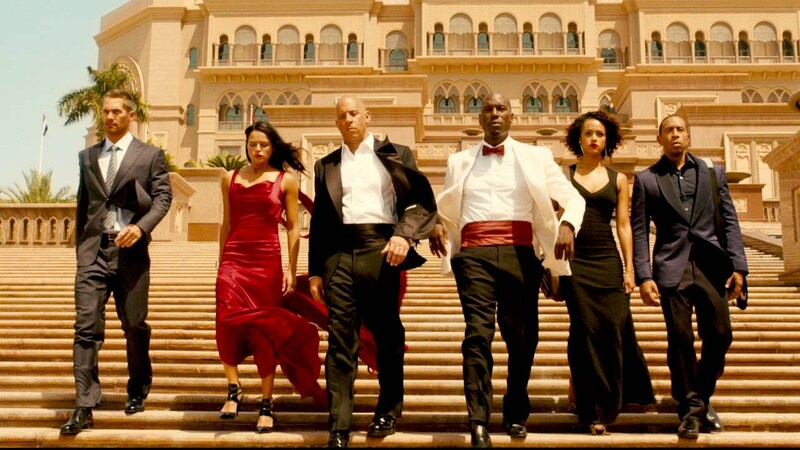 Furious 7 begins with members of the crew finally settling into normal lives as they were only just recently allowed back into the United States. However, their lives are quickly upended as special forces assassin Deckard Shaw swears vengeance against the crew for their actions against his now comatose brother Owen Shaw (Luke Evans). Deckard sends them a warning of what’s to come by killing Han (Sung Kang) in Tokyo and detonating a bomb at the Toretto house. Deckard then breaks into Hobbs’ (Dwayne “The Rock” Johnson) office in order to steal files about Dom’s crew. Hobbs was not having any of that, so the two have an epic brawl of table shattering proportions. However, the fight ends as Deckard detonates a bomb and Hobbs dives through a window to save his partner Elena (Elsa Pataky). After Han’s funeral Dom notices an unidentified car watching the service, so he jumps in his car and chases after it. Once he realizes it is Deckard the two have a classic game of chicken that ends in a very intense head-on collision. 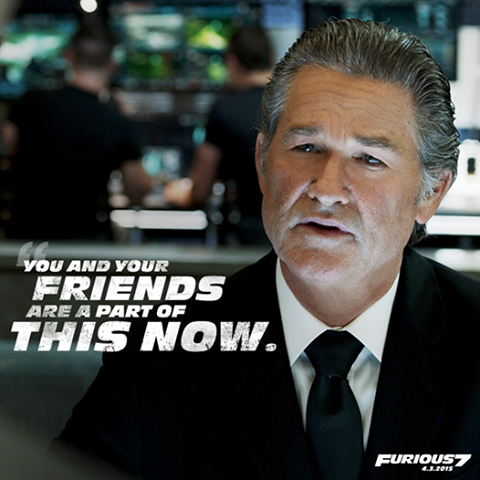 This is when we are introduced to a brand new character named Frank Petty who is leader of a covert ops team. Frank states that he will help Dom find Shaw as long as he and his crew prevent a mercenary named Jakande (Djimon Hounsou) from stealing a computer program called God’s Eye. In order to do this the team has to rescue the program’s creator Ramsey, played by the stunning Nathalie Emmanuel. There are several Fast & Furious style car stunts that are unfathomable for real life but were still fun to watch on the big screen. Roman (Tyrese Gibson) & Tej (Ludacris) come up with a ridiculous plan to drive the team’s cars out of a flying aircraft in order to launch a blindside attack on Jakande. During the crew’s heist in Abu Dhabi Dom & Brian launch a car through three skyscrapers in breath-taking fashion. Also, there was a jump from a crashing bus to a speeding car by Brian, Dom launches his car down the side of a mountain, Ramsey is tossed around in a car version of hot potato, and Dom launches his car from a collapsing parking-garage at a helicopter. The ridiculousness was at an all-time high, but I still loved every minute of it! 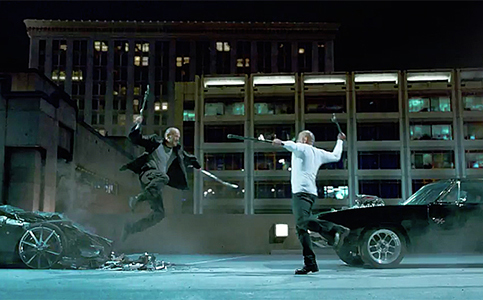 Aside from the insane car stunts, there were also a bunch of awesome fight sequences by several different characters throughout the film, which was kickstarted by the Hobbs vs. Shaw glass-shattering battle. For instance, UFC Champion Ronda Rousey had an excellent brawl with Letty (Michelle Rodriguez) and Brian faced off against Jakande’s right-hand man Kiet (Tony Jaa). However, the fight everyone was waiting for was the final showdown between Dom and Deckard. Of course they started with another game of car chicken but they then continued on to a good old fashioned street fight with wrenches/broken car pieces as their weapons of choice! 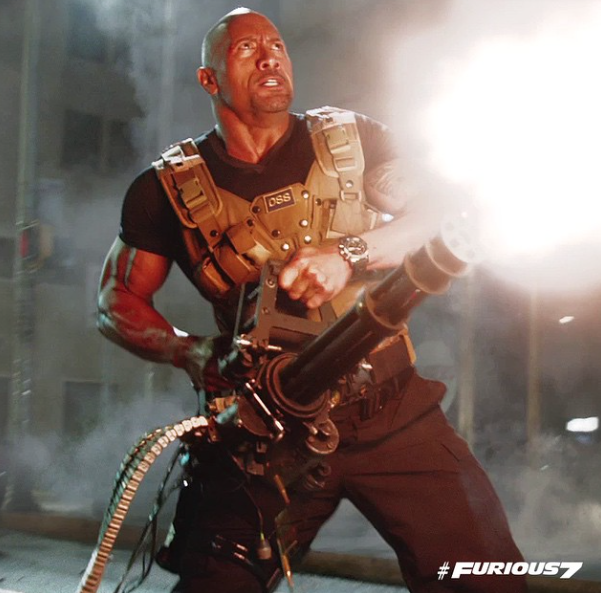 One of my favourite additions to the Fast & Furious Franchise has been Dwayne “The Rock” Johnson as Hobbs. I’ve been following Dwayne on Instagram every since I registered for an account because he is one of my favourite actors, has a glorious workout regimen, and is a big teddy bear that always goes the extra mile for fans! Therefore, every trailer, picture, and video he has posted during the last few months has gotten me more and more excited for the April 3rd release date! After watching the film I was a tad disappointed because after Hobbs fights Deckard Shaw in the beginning he is only in the film for a few scenes at the end. However, after months of anticipation I finally got to hear him say the two iconic lines “Daddy’s Gotta Go To Work.” and “Woman, I Am The Cavalry.” which basically completed the film for me! Lastly, at the end of the film there was a very touching tribute for Paul Walker that had me uncontrollably sobbing. Check out the link below for the full song “See You Again” of both artists with some of the film tribute mixed in.